Kiro Gligorov stayed on the function president of the Republic of Macedonia (1991-1999), who was elected when the republic was part of Yugoslavia, and led the republic to independence in 1991. Kiro Gligorov was born in Stip, on May 3rd 1917. He originates from an urban family, actively involved in the national liberation movement in Macedonia in the past and the beginning of this century. Gligorov completed secondary education in the Skopje, and graduated at the Law Faculty from the University of Belgrade in 1938. During the period of his studies, Kiro Gligorov actively participated in the students movement in Belgrade, where he was arrested in 1937, as a political activist by the Royal Yugoslav government. After graduation, he returned to Skopje, where he worked as an attorney in a private bank. In 1941 Kiro Gligorov joined the Communist-led Partisans, resistance fighters to the Axis occupation of Yugoslavia during part Second World War. Gligorov actively took part in the anti-fascist and people's liberation movement in Macedonia. A member of the People's Liberation Struggle (Narodno Osloboditelna Borba) from 1941. Member of ASNOM (Anti-fascist Assembly of the National Liberation Movement of Macedonia). 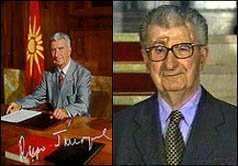 In the period 1944-1945 he is appointed in charge of finances of the Presidium of ASNOM, at the time of the proclamation of the Macedonian State. Member of AVNOJ (Anti-fascist Assembly of the National Liberation Movement of Yugoslavia). The group's founding leader, Josip Broz-Tito, became the ruler of Yugoslavia at the end of the war. Kiro Gligorov joined the Communist party in 1944. Following the end of the Second World War and the proclamation of the People's Federal Republic of Yugoslavia (Federativna Narodna Republika Jugoslavija), Kiro Gligorov is sent by the leadership of the people's Republic of Macedonia to Belgrade (then the Communist-ruled federation of Macedonia and five other republics). He worked in state politics and Communist party organizations, earning a reputation as a "reform-Communist" and an expert in finance and economics. From 1945 to the beginning of the 70s, Kiro Gligorov holds specialized executive functions in the spheres of economy and finance: Assistant General Secretary in the Government of the People's Federal Republic of Yugoslavia (1945-1947); Assistant Minister of Finance in the Ministry of Finance of the People's Federal Republic of Yugoslavia (1952-1953); Deputy Director of the Federal Institute for Economic Planning (1953-1955); Federal minister of finance from (1962-1967); Vice-President of the federal government from (1967-1969); and a member of the Communist party's central committee from 1964, Gligorov was one of the principal architects of Yugoslavia's liberal, pro-market economic reforms of that period. He is one of the leading economist supporting the advancement of market economy in Yugoslavia. Becomes the Head of the Federal Government team that conceptualized and carried out the first market based economic reform in Yugoslavia, in the 60s. It was the first such economic reform in the them "socialist world". Unfortunately, due to well known political reason, reforms were suspended. In the upcoming period, however, he is active in conducting theoretical research and socio-economic studies pertaining to the market economy. Throughout this period he was involved as: member of the Council of the Institute for International Politics and Economy President of Institute for Social Sciences participant in numerous specialized conferences in Yugoslavia and the world and published numerous articles in specialized publications. At the beginning of the 70s he was elected: member of the Presidency of the Socialist Federal republic of Yugoslavia (1974-1978) President of the Parliament of the Socialist Federal republic of Yugoslavia Immediately following his function as President of the Parliament of the SFR of Yugoslavia, he is practically removed from the political life in Yugoslavia. However, throughout this period he is active in pursuing theoretical and expert research. Almost 15 years later, in the late 1980s, he is once again incorporated in the Government team of Ante Marković for the implementation of a new market economy in Yugoslavia. When Yugoslavia plunged into economic crisis in the 1980s, Gligorov headed a high-level commission that drafted market reforms, but these reforms were never implemented. At the onset of the crises in Yugoslavia (1989-1990) he makes a come back in the political life of Macedonia, promoting multi-party elections and the introduction of a market economy. 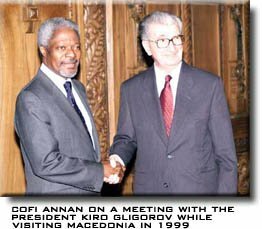 These activities resulted in his election as President of the Republic of Macedonia, on the first free, multi party elections held on January 27, 1991. While in office as President of the Republic of Macedonia, the Republic of Macedonia has: Proclaimed its independence on a general referendum on September 8th, 1991. Through this act, the Republic of Macedonia became the only Republic of the former SFR Yugoslavia to attain its independence though a peaceful and legitimate manner Declared its new Constitution on November 17th, 1991 - the document establishing the foundations of a civil society, legal state, parliamentary democracy and market economy. Succeeded in having the Yugoslav National Army (JNA) leave its territory though agreement (spring 1992, thus making the Republic of Macedonia the only one of the Republic which did not participate in the war in the former Yugoslav region. Fulfilled its centuries old ideal for attaining an equal place in the international family of nations. On April 13th, 1993, the Republic of Macedonia became a member of the Organization of the United Nations. 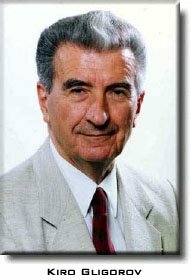 On the first general presidential elections in the Republic of Macedonia held in October, 1994, Kiro Gligorov was re-elected President of the Republic of Macedonia with a five year term. The difficulties that President Gligorov faced in the period leading up to the outbreak of full-scale war between Serbs and Croats in June 1991 were especially acute. He understood that in the event of a violent collapse of Yugoslavia, Macedonia would come under the greatest pressure and, in all probability, be the central theater of war. Obviously Bosnia was the most vulnerable because it formed a wedge between the two main belligerents - Serbs and Croats, neither of whom disguised their territorial claims on the republic. But Macedonia is still threatened for the same reasons. Macedonia succeeded, during the time of President Gligorov, to leave the Yugoslav federation without bloodshed. President Gligorov also negotiated the voluntary withdrawal of the Yugoslav People's Army by the end of April 1992 (this, of course, coincided with the beginning of major offensives in Bosnia-Herzegovina). On the level of representation in government, President Gligorov has worked hard to integrate the main Albanian political parties into the Macedonian state. In 1991 Gligorov's government became involved in a dispute with Greece over the republic's use of the name Macedonia, a symbol on its new flag (the Star of Vergina), and articles of the Macedonian constitution that Greece believed implied territorial claims to the Greek province of Macedonia. Gligorov also faced domestic unrest, as the republic's large Albanian minority began pressing for greater cultural and political autonomy. In 1995 his government signed an accord with Greece in which it agreed to remove the Star of Vergina from it's flag and to revise some articles of the constitution. after the attempt for assassination"
On October 3rd 1995, two days after talks and a handshake between Yugoslav president Slobodan Milosević and Macedonian president Kiro Gligorov, Gligorov was seriously injured by a bomb, around 9:45 AM, as his vehicle was on it's way to the Presidential office in the Assembly of the Republic of Macedonia. The bomb was planted in a car, Citroen Ami 8 (registration plates KU-240-MB), parked on the street "Macedonia", in the Macedonian capital, near the old railway station. Several citizens were injured and considerable damage was done to the buildings in the vicinity. The President's chauffeur was killed in the attack, while the President was immediately conveyed to hospital. The police had closed off the Macedonia's borders. "The detonation was terrible. When I came to, I saw fire and I thought a gas tank had exploded. Then I saw the president's car and a man on the ground. I ran up and saw the man was dead. His brains were blown apart and there was blood all around him. A lot of blood. I covered him. Only a madman could have done that. Only a madman." - An eyewitness. A photo robot had been made of the suspect driving the car. The case remained open. The bomb was possibly work of a group of we can call them anti-Macedonians, Multinational Organization from a neighboring country (Zemunski Klan, Bulgarian National Octopus), who wanted to ruin the Government of the Social-Democrats. Kiro Gligorov survived after several operations in the hospital and lost one eye to the blast, which is now replaced. vehicle blown in the explosion at 9:45 AM (October 3rd 1995)"
President Gligorov returned to his presidential duties at the beginning of 1996, after appearing for the first time in the public after the attempted assassination on Orthodox Christmas mass in the Archbishopric Church of St. Clement (Kliment) of Ohrid, in Skopje, Macedonia. During a visit to the United States in June 1997, Gligorov personally pleaded with US President Bill Clinton for continued deployment of United Nations (UN) troops in the republic to maintain regional stability.